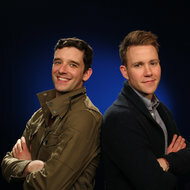 Michael Urie, left, and Christopher J. Hanke. The Off Broadway understudy Clancy O’Connor drew attention and full audiences last month when he went on for Michael Urie in the hit play “Buyer & Cellar,” but he didn’t end up with the permanent gig when the time came to recast the one-man show. The producers announced on Thursday that Christopher J. Hanke, who played Bud Frump in the 2011 Broadway revival of “How to Succeed in Business Without Really Trying,” will begin performances on March 18 as Alex More, a struggling actor who takes an unusual job working for Barbra Streisand. Mr. Urie is departing the production at Barrow Street Theater to start a national tour of the play, by Jonathan Tolins, with performances set for Chicago, Los Angeles, and other cities. Mr. O’Connor, who starred in four performances during Mr. Urie’s vacation, said on Thursday that he would continue as the understudy in the Off Broadway production. The producers had said last month that they planned to replace Mr. Urie with actors who had more credits and a higher profile than Mr. O’Connor — a typical recasting strategy, though the producers said they could envision giving the job to Mr. O’Connor in the future. Mr. Hanke himself was replaced by Mr. Urie as Bud when he left “How to Succeed” in early 2012.